The name of our company, SHIELD Scientific, reflects the particular focus we have on the laboratory and high technology sectors. Our aim is to bring to these markets Personal Protective Equipment (PPE, laboratory gloves and cleanroom gloves) that for the first time is adapted to the needs of these segments. Indeed up until now, the products typically sold to the laboratory and high technology sectors originate from the medical or industrial field. Accordingly we have set five priorities for responding to the real needs of users in these sectors. We have discovered an aspect of the regulations that was not appreciated by some manufacturers, whilst others have chosen to ignore it. 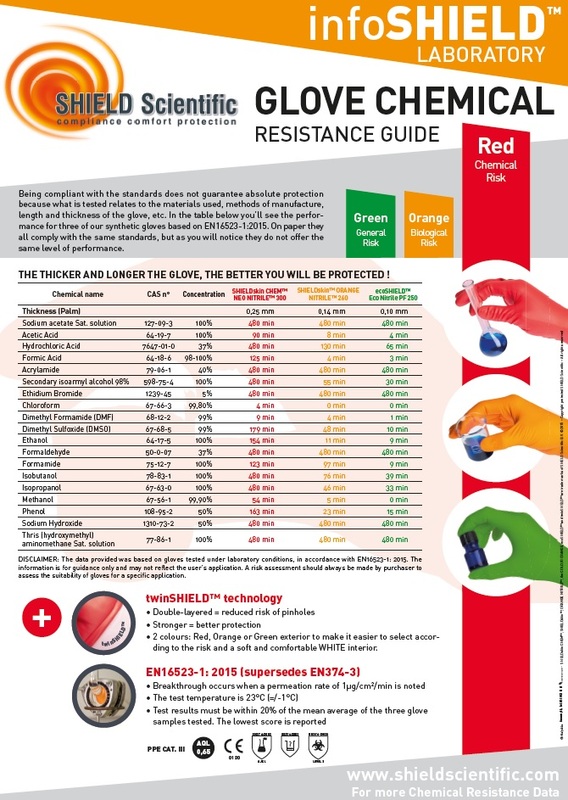 Manufacturers that have registered their gloves as Category III PPE (Complex Design) and have had their gloves tested against the 2003 version of the standards have overlooked the minimum liquid proof length requirement specified in EN 374-1:2003 and outlined in EN 420:2003 + A1:2009. The latter would entail gloves being respectively 250 mm and 260 mm for sizes 9 (Large) and 10 (X-Large). With the exception of long length gloves, at present few disposable glove manufacturers adhere to this regulatory requirement with the majority of standard gloves being 240 mm. The latter is the minimum length required for medical exam gloves. SHIELD Scientific is the first manufacturer to market gloves with a length of 260 mm providing superior wrist protection from chemical splashes. We are amongst the first manufacturer to offer cleanroom gloves and laboratory gloves with an AQL of 0.65, which is the highest level of protection to penetration by microorganisms according to EN 374-2:2014 Level 3. The norm in the market is an AQL of 1.5 (EN 374-2:2014 Level 2). In an effort to enhance the barrier properties of our gloves to microorganisms, we additionally test them for resistance to viral penetration (ISO 16604:2004 procedure B / ASTM F1671-97b). This combination of benefits makes the SHIELDskin™ range the natural choice for all those in the laboratory exposed to micro-biological risks. For some researchers, protection of assays is the key priority. For this reason we have adopted a traceability procedure normally associated with cleanroom gloves. Likewise particular care is taken with SHIELDskin™ ORANGE NITRILE™ gloves, which undergo additional washing and chlorination to achieve a high level of cleanliness. These gloves are washed no less than nine times in contrast to the usual three washing cycles. For users of sterile glove, the SHIELDskin XTREME™ Sterile White Nitrile 330 DI+ and the SHIELDskin XTREME™Sterile Latex 330 DI+ gloves offer the highest level of process and personal protection with an Acceptable Quality Level (AQL) for pinholes of 0.65 (EN 374-2:2014 Level 3). AQL is a crucial parameter for determining barrier properties. An AQL 0.65 (EN 374-2:2014 Level 3) represents over 50% less defects than comparable sterile gloves on the market, providing superior process and personal protection from liquid penetration by micro-organisms and chemicals. The comfort and well-being of glove-wearers is an integral part of the development process. In particular we have focused on the risks posed by gloves to the health of users. Thus our Natural Rubber Latex (NRL) gloves have levels of protein below those typically encountered with other gloves on the market. Whilst numerous manufacturers are engaged in a rationalisation process – in particular a reduction in the range of sizes in an effort to cut costs – SHIELD Scientific is committed to maintaining the five sizes in order to offer choice for optimum fit. As part of an unstinting effort to produce gloves that maximize comfort for glove-wearers, we embrace the latest advances in nitrile technology. By offering gloves based on Skin Nitrile™, users can experience a level of elasticity not normally associated with nitrile gloves. Naturally these steps have been taken whilst appreciating the economic restraints in the market.